Construction projects by their nature require multiple teams to complete, so when something goes wrong a team of experts is often needed to solve the problem. That’s where MC Consultants has built its reputation as one of the prominent construction forensics groups in the Western United States. MC Consultants consists of five divisions — mc2, mc3, aquaForensics, CE Prime and Dunn Environmental Services — which together generate $10 million in annual revenue. The firm is staffed by 50 people who are experts in their respective fields — from architects and contractors to civil engineers and environmental investigators. Ducommun estimates the Western U.S. market of the construction defect industry at $150 million in collected fees. 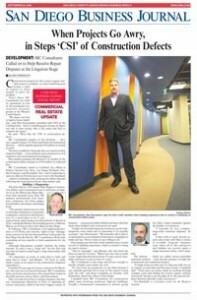 MC Consultants, based in Carlsbad, has offices in Denver; Kansas City, Kan.; Las Vegas; Portland, Ore.; San Francisco; and Scottsdale, Ariz., and it is planning to open an office in Florida next year to serve the Southeast — which is exploding with construction defect lawsuits following the construction boom, Ducommun said. The firm held its 15th annual West Region Construction Defect and Construction Law Conference on Sept. 16-18 at the Hilton San Diego Bayfront that attracted more than 300 industry professionals from insurance companies, law firms, judges, homebuilders, developers and design firms. “The seminar started out as a way to introduce themselves to insurance companies, contractors and lawyers; now it’s a good place to be if you want to know what’s going on at the forefront of the law in 2010,” said Keith Bremer, the founding partner of Bremer Whyte, an 85-lawyer firm with offices in San Diego. In February, MC Consultants’ civil engineering division, or CE Prime, also won the “right of way” management contract for the new Sunrise Power Link project by San Diego Gas & Electric. MC Consultants will provide consulting services specific to land acquisitions for the project. Although Ducommun wouldn’t disclose the dollar amount, he said it was a “huge win” for the firm and one that he hoped would begin a long relationship with SDG&E. MC Consultants hires top former practitioners who earned their stripes in the field and now advise others, said Ducommun. They not only know how to swing a hammer, but they can communicate effectively in front of deposing attorneys and juries, which is the firm’s biggest source of business — construction defect defense attorneys that hire them when builders and contractors are sued. Ducommun says the firm’s staff members have a track record of building experience, which is critical to being an expert witness. MC Consultants is also large and diverse enough to handle complex cases under one roof. “It’s nice from my perspective to use them because I can typically generate all or most of the experts I need with one call,” said Kurt Campbell, an attorney with Klinedinst, which has offices in San Diego. Campbell hires MC Consultants for construction defect cases involving mixed-use, high-rise buildings. Usually a homeowner’s association or investor group has filed a legal complaint against the builder or contractor. “I typically do very complex, large-scale construct disputes,” he said. A firm with so many diverse experts also works well when it comes to so-called “wrap-up” insurance cases where all of the contractors and builders are covered under a single insurance policy, said Campbell. The policies — which are called owner-controlled insurance policies — have become popular on high-rise commercial and residential projects.